Tonight I had a serious hankerin' for a fish sandwich. 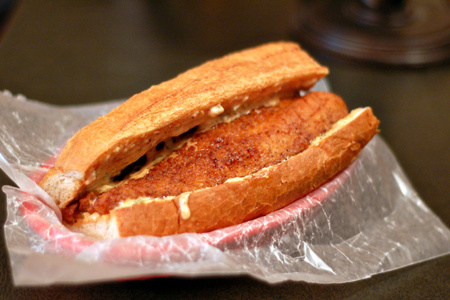 So, I remedied the situation by frying up about a 10-inch catfish fillet and laid it on a toasted roll with some Creole tartar sauce that I whipped up. Here you have a serious man-sized fishwich! Combine all of the tartar sauce ingredients in a small bowl, mix well and refrigerate. In a large heavy pan or fryer heat the oil to 350º. You'll obviously need enough to completely submerge the fish. Prepare the fish per the fry mix package instructions. Fry the fish until it is golden brown and crispy, about three to five minutes depending on the thickness. Cut an split a piece of the bread large enough to just hold the fish. Toast the roll halves under the broiler. Drain the fish on paper towels. Schmear a good amount of tartar sauce on each roll half and add the fish. Now that sure looks tasty!! That Creole tartar sauce sounds awesome too! YUMMMMM!!! Fantastic! Being from Alabama, catfish is one of the essential food groups for me. One of the local BBQ places here has taco night and makes fried catfish tacos with a spicy tarter sauce and slaw. They are terrific. Might be a worth variation of your great lookin' catfish po-boy!